Anyway, me and some pals were out round Camden, one of London’s musical Meccas, not far from the epic Camden Roundhouse and Chalk Farm tube station, which is also pretty epic as it allows one to reach vaunted venues such as that rounded house. We just fancied a drink and a bit of live music. Detouring off the main road, along we strutted (in a manner not too dissimilar to The Bee Gees) until we came to the aforementioned Elbow (if I shorten it to Fiddler’s it just sounds wrong.) This was my first time here, and what a rustic hive it turned out to be; a proper music den; stale, in a seductive way, with faded furnishings and plastered with band posters, this pub had real battle scars of musical valour. Far as I’m aware The Elbow has an eclectic array of performers, and as of Thursday night the word ‘eclectic’ would best be superseded by ‘ecclesiastic.’ This was because a larger than life gospel act called Reverence were illuminating the stage on a night ran by showcase company Formidable Fusion. Ensnared by the randomness, I was amazed by the vocal power and the glory of this group and bedazzled by the combination of Ragga, Calypso, Latin and African beats. It was one of the most unique ways in which I’d downed a few lagers. As my mates and I supped on our bottles of Becks, the unity in the room was beautiful to behold as the joy of Reverence would have even got Richard Dawkins feeling some spiritual sentiment. 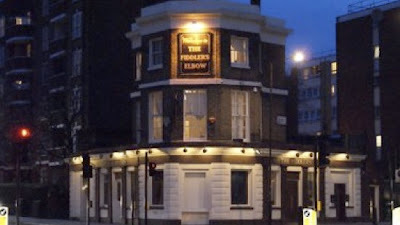 All in all, a quality night; check out The Fiddler’s Elbow pub in Chalk Farm for a bit of freewheeling, unpretentious fun. Peace be with you. Looking for more live music inspiration? Check out the Top 10 Bars & Pubs in London for Live Gigs.